Spacious accommodation with a total floor space of nearly 200 sq m.
Huge open plan lounge / dining room / kitchen. Three sets of double doors provide 'outdoor living, indoors'. Fully equipped kitchen including microwave oven and gas cooker. Two spacious, fully furnished, air-conditioned bedrooms with king sized beds. Wall mounted LCD HD TVs in the bedrooms with media players. Two bathrooms including one en-suite. Remote controlled ceiling fans throughout. Library on the mezzanine floor. This can be used as a third bedroom if required (not suitable for children). Living room has high vaulted ceiling and access to large terrace and veranda. 50" wall mounted LCD HDTV with Yamaha, Dolby 7.1 home cinema system. Satellite TV with many HD movie, sport and news channels. Free wifi internet connection throughout the villa. Two internet providers each with a 20Mb fiber connection. Free coffee, tea and drinking water. Games room providing a pool table, dart board, board games and mini bar. BBQ area available for your use. Free taxi service to and from the pier at Mae Haad to ease your arrival and departure. Complimentary taxi service to and from Sairee Town up to 10.30pm. Laundry service available at local rates. Use of mobile phone pre-programmed with many useful numbers. Information pack including menus for many excellent local restaurants with delivery service. Books, DVD's, CD's and board games are available for your use free of charge. Our Penthouse apartment is truly a one-off property on Koh Tao. Its vaulted ceiling and open plan design are instantly striking, giving the sense of space and light and its panoramic views of Koh Nang Yuan, the surrounding jungle, Sairee bay and the Gulf of Thailand are mind blowing. You have one hell of a place here! We just loved our stay and all you did for us. Was so unexpected. Thank you for inviting us into your world and giving us the best vacation. Take care and we will see you again hopefully sooner rather than later. The Penthouse at Koh Tao Star Villa has nearly 200 square meters of living space providing ample room for up to 6 people. There is an open-plan living/dining/kitchen area; 2 bathrooms (one en-suite), two fully furnished, air conditioned bedrooms with king sized beds; a library on the mezzanine floor; and a large wrap-around west facing terrace. Add to this some high quality Yamaha audio/visual equipment, free Wifi, stunning panoramic sea and sunset views and customer service that goes “the extra nine yards” (including our free taxi service till 10.30pm) and you have an amazing place to stay on Koh Tao. If there is just the 2 of you looking to stay in this fantastic place. We can close off the back bedroom and en-suite and give you a nice discount. Can’t be bad. Koh Tao Star Villa is off the beaten track – about a 15 minute walk from Sairee town and Sairee beach. The result is a very peaceful location away from the rattle-and-hum of the throng and yet within easy access of the life and lights of the town/beach. By scooter this trip takes less than 5 minutes and we do provide a free taxi service to Sairee up to 10.30 at night if you need it. 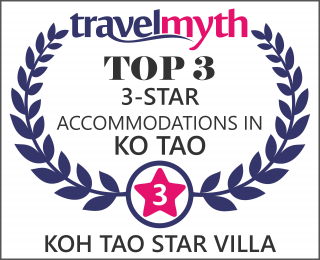 Koh Tao Star Villa is committed to ‘Eco-tourism’ (a very much over used term in our opinion) and maintaining this tropical paradise. To these ends we are very proud of the steps we have taken to make Star Villa as eco friendly as possible. We ask that you please be a responsible visitor to the island, wherever you stay on Koh Tao. The Penthouse is designed to accommodate 4 people but can accommodate 6 using the library on the mezzanine floor as an extra bedroom. For the sake of clarity, this extra bed is a queen sized inflatable mattress supplied with linen, pillows, extra towels and dressing gowns. Please note that this room is not air-conditioned. It does have excellent fans for cooling but there is no air-con. The air-con units in the bedrooms are designed for and are the right power to cool the bedrooms only. They cannot be used to cool the whole Penthouse. Please note that there is an additional charge for the supply of the extra mattress. The following prices are in Thai Baht. For up-to-date currency conversion click here. Please note that the actual currency conversion rate may vary slightly at time of booking. We require a 30% deposit when booking with us. This secures your booking and is non refundable, though it is transferable. The balance is then payable in Thai Baht at check-in. The minimum booking period for The Penthouse is 2 nights. 1,400 baht per night (1 or 2 persons sharing the front bedroom). 1,800 baht per night (3 or 4 persons). 1,600 baht per night (1 or 2 persons sharing the front bedroom). 2,100 baht per night (3 or 4 persons). 1,900 baht per night (1 or 2 persons sharing the front bedroom). 2,400 baht per night (3 or 4 persons). For our ‘long term’ guests please note that we do not provide our normal free daily taxi service to Sairee (as people staying for this length of time tend to require a greater level of freedom anyway and they rent a motorbike or scooter for their transport around the island) – we do still provide a free taxi service to and from the pier when you arrive and depart; also we do not provide a daily maid service – instead we clean every three days (including changing linen and towels) – we do ask that The Penthouse is kept tidy inbetween cleans.